Happy Monday, My Lovelies! I hope you all had a wonderful Veteran's Day Weekend. So grateful for our veterans and their service to our country. Now that the weekend's over, it's back to reality and chores. 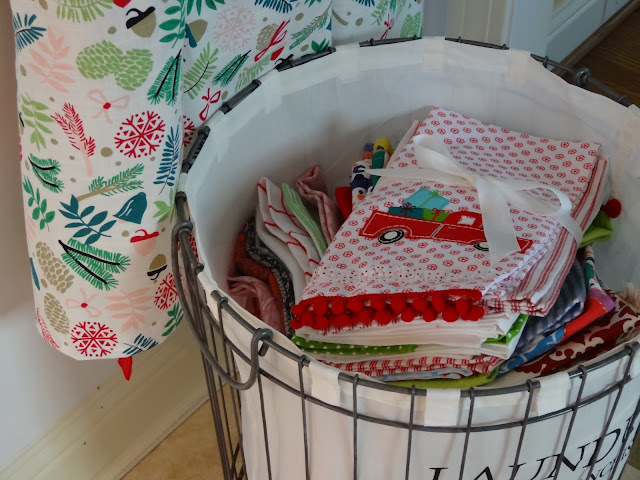 We've been making some changes in the laundry room, and I wanted to share one of them with you today. I have a unique collection: I collect tea towels and dishtowels. I've been collecting them since we were first married, and I use them everyday. 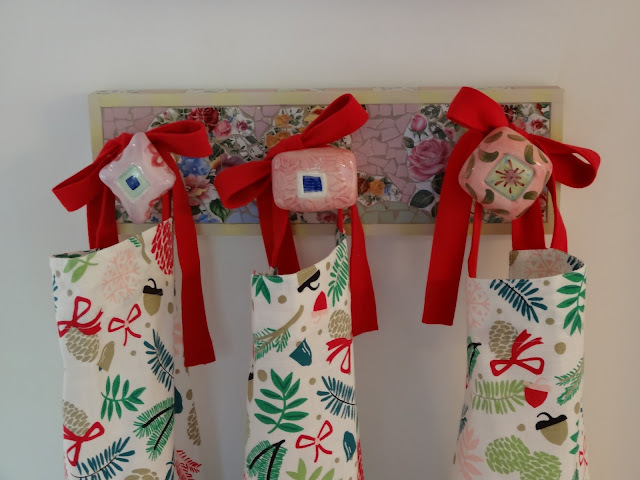 Many of the dishtowels are seasonal, and I enjoy decorating with them and using them in our kitchen. Also, I'm one of those weird people who iron everything. I iron the towels I use each week. Yes I do! Sometimes I even use ironing or linen water. I like to watch HGTV, a Hallmark Channel movie, or maybe a show on BBC America while I iron. It relaxes me, and ironing is my favorite chore. 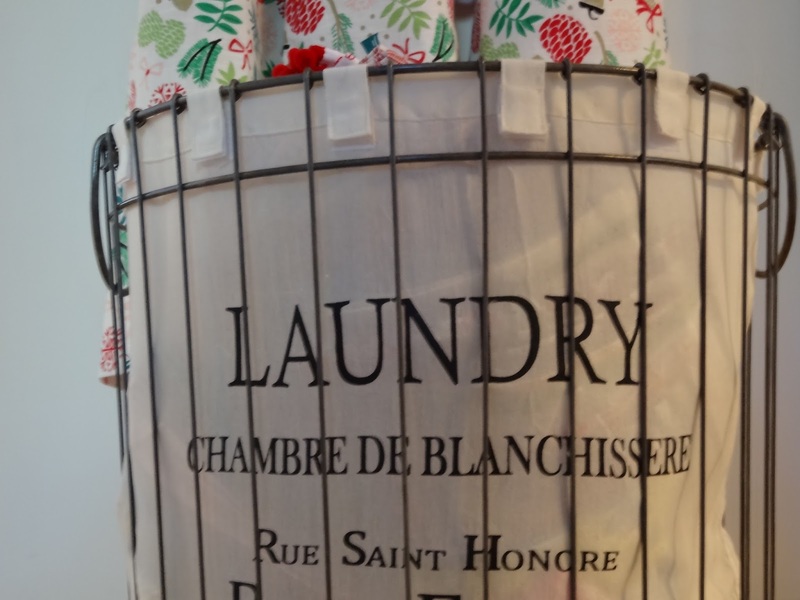 For years I've wanted a French wire laundry basket for my collection of towels, but I could never afford one (the lowest price I've ever seen is around $175.00). But I found this one on sale a couple of weeks ago at World Market (less than $40.00) so I bought it. I ironed my Christmas towels and tied them together with a ribbon, all ready to enjoy during the Christmas holidays! I usually buy them at the end of the season on sale to enjoy the following year. 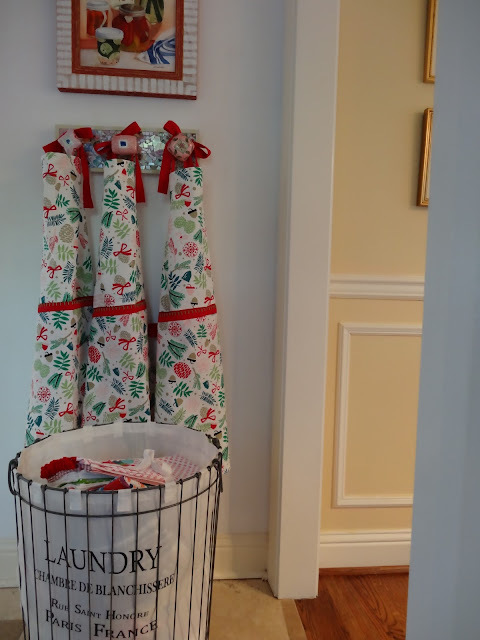 My basket is outside my laundry room between the kitchen and dining room. This is my oldest towel, bought in 1988. It was the first one I bought after we married (we were married on Spring Equinox, right before Easter). I like having them close at hand, and I think the laundry basket and aprons make a homey vignette. I will be deep cleaning our kitchen today, and begin phase two of Christmas decorating. Phase one was completed last week. We decided not to decorate for Thanksgiving this year so we can enjoy Christmas a little longer. 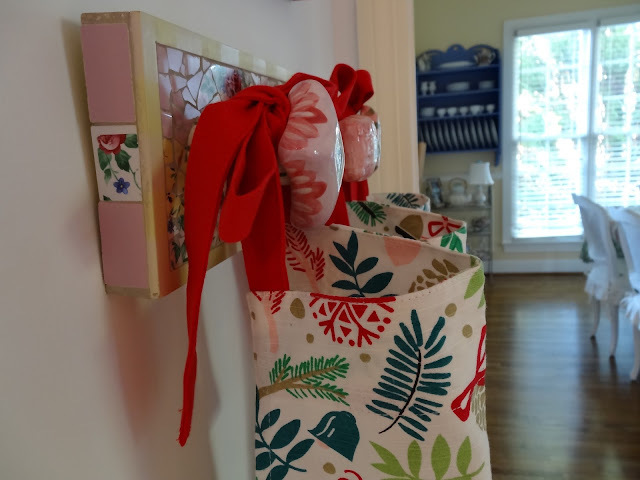 I'll begin sharing our Christmas decor later in the week! The basket you bought is perfection for towels or something else fun that you'll think of along the line. 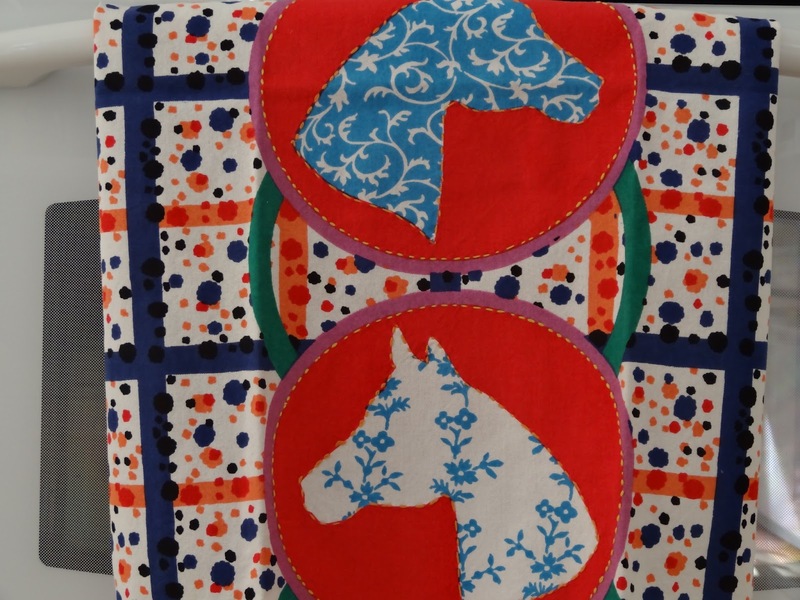 That is such a darling collection, Ricki Jill! 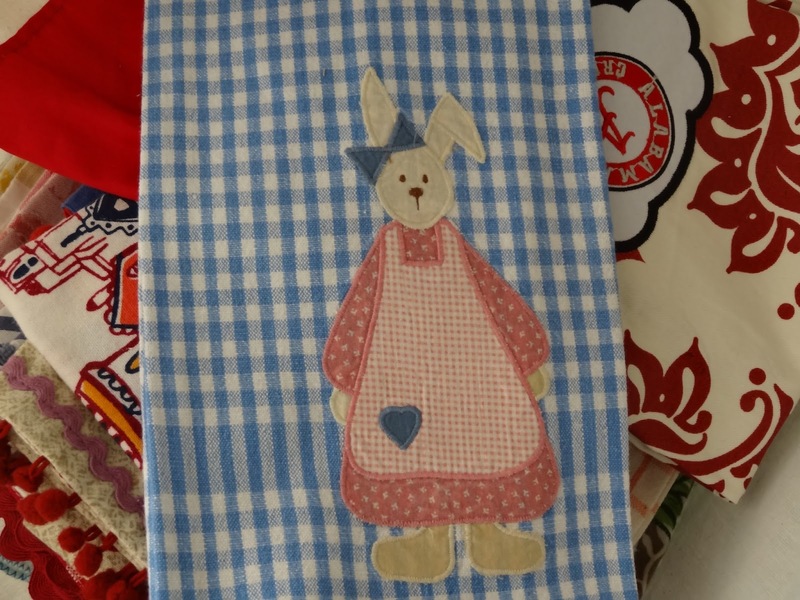 I don't seriously collect dishtowels, but it's always one of the first areas of a store I head toward. I iron them if they need it....not that fond of ironing, but maybe I could send them your way! 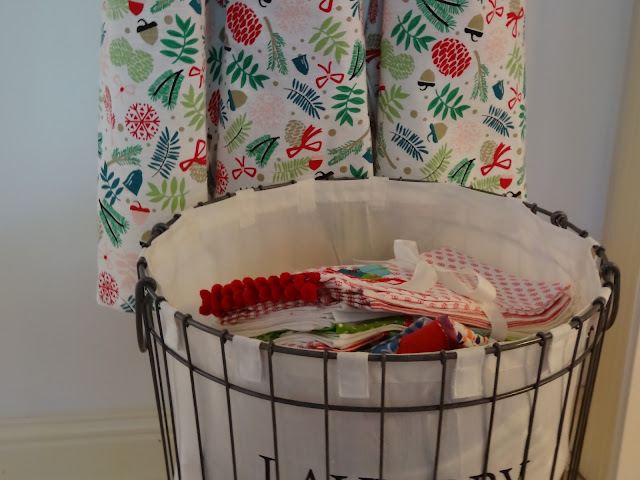 The basket is adorable, and really does make a cute and homey vignette with the aprons...I love aprons, too! Sooo sweet Ricki Jill. Love all your collected towels. Your aprons for Christmas are pretty sweet too. RJ, your collection is lovely and I love how you have them close at hand to enjoy when not using them. Your new basket is perfect and yes they so expensive! I have a nice collection of towels but only have a few out at a time to enjoy. I'm getting inspired here today to do something similar. Thanks for sharing your idea. ps I use to iron everything and enjoyed it, not so much any more. Unique collection! I do love that basket, too. Your little mosaic wall pegs thingamajig is really cute -- did you make that? I would hate for you so see my dishtowels -- they get bleached, and then every time I turn around, you know who is using one for some nefarious purpose, so that it has to get labeled "rag" with a laundry marker! I go through them so fast, it would make your head spin. Thank goodness for HG where they have an endless supply. I enjoy to iron. I like how nice things look after. I do not iron our towels, but I can see how lovely yours are, maybe I should start. Such a lovely collection of towels. It is nice to get them out early to enjoy them. That looks adorable! I need ironing lessons Ricki Jill, I can't iron a thing, I always make it worse! I have to photoshop wrinkles out of my tablescapes :) seriously! 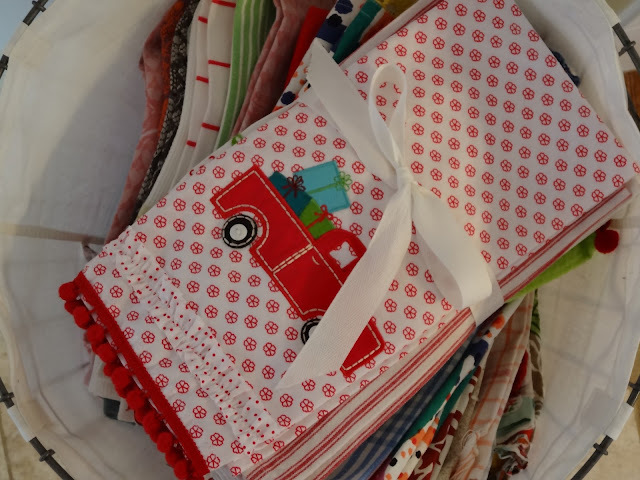 Your vintage collection is so sweet, and I love love your apron rack! Can't wait to see the rest of your decor!